The image was published by tnm some days back in which ex CEO of Apple Steve Jobs was shown really weak. TNM blog published a picture 2 days after Steve Jobs officially resigned from Apple as CEO. This image was the first image after very long time and showed steve jobs in really weak condition. But there are rumors spreading that the picture is fake. Graphics editors have analyzed the picture and they say that this image is fake. First and foremost the released photo is a poor quality one. This is likely done to cover up more obvious alterations made to the photo. Area here is pinched in to give jobs a frail look. wrapping is done in this area. Notice the bubble shape prouced in this part of his face. cut from the original image and pasted back to the altered image. Ankhle skewed here. these areas are cropped out. The area on the right is cropped and transform to match the frail left. To be honest, I didn’t know about tmz at all before. 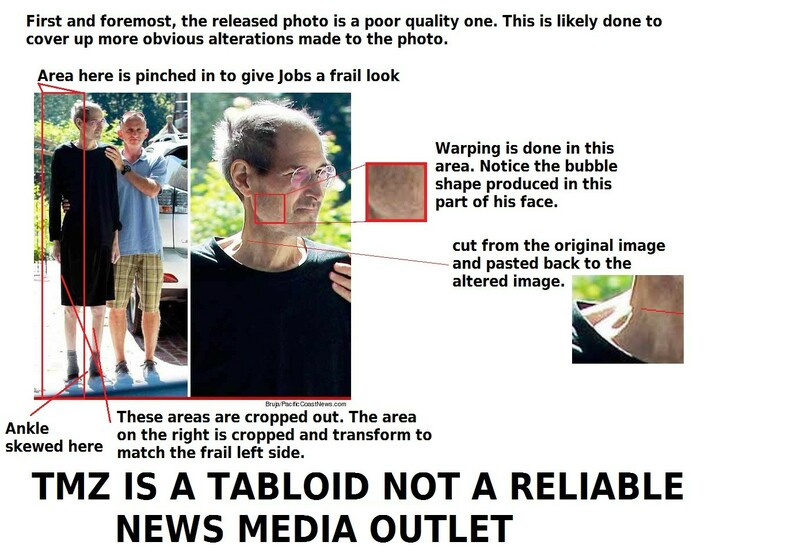 The claim that tmz is a tabloid and not a reliable news media outlet is a big one!